Community residents identified 11 key issues affecting the economic and environmental health of their neighborhoods. The following chapters provide a background of the issue, the results of the project’s research on the issue, the impacts of these findings on West County, and recommendations for improving the problem. 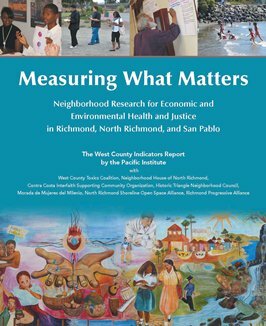 These chapters are part of a report published by the Pacific Institute and seven local partner organizations, Measuring What Matters: Neighborhood Research for Economic and Environmental Health and Justice in Richmond, North Richmond, and San Pablo which quantifies how serious, avoidable problems have become chronic and offers solutions for a better, more equitable way of life in West County.